Swap the staff meeting for a race meeting next time you’re looking to entertain your customers, employees or colleague with one of our Corporate Entertainment packages – Each package is bespoke to your specific needs and requirements. As far as the Karting is concerned, you can choose from any of our packages. Need to entertain 7-12 people? Our Solo 40, 60 or 80 Races are awesome. Have 13 – 36 drivers? Grand Prix or Team Races are the event for you. Have more than 36 drivers? no problem. We can even build an event bespoke to your needs or group size. 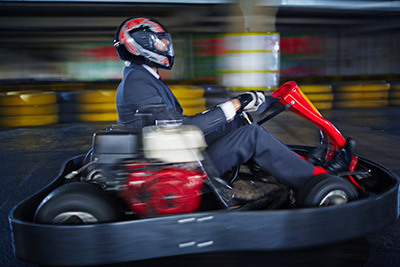 Which ever package you choose, your staff or clients will love our NG1 Race Tuned Pro Kart and specially designed indoor track for a Corporate activity with a difference. Some Venues dictate what you should have as part of a corporate package – not here. Tell us what you need and we can build bespoke packages to cover just what you require. Some of what we can do is listed below. If something you really need or want isn’t listed – please ask us. If we haven’t provided what you need previously – we can definitely look into making it happen for your event. All Corporate Bookings are subject to VAT at the current rate. Steve Wright is feeling pumped at Cannon Raceway with Sophie Wright and 2 others. "Great Racing"